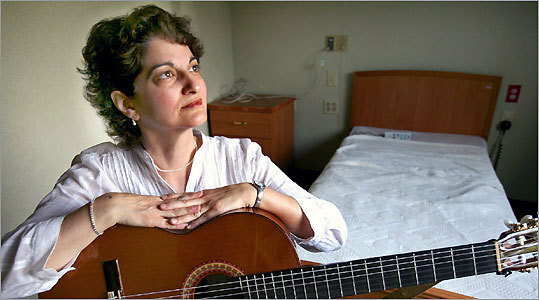 The title of classical guitarist Marcia Feldman's new CD, released June 17, is "Between the Worlds." Perhaps no idea could better sum up the unique realm that Feldman's music inhabits. She is a hospice musician - a performer who plays tunes to soothe the dying. The worlds she refers to in the CD's title are those of life and death, and her music is designed specifically to ease the transition from one to the other. It's an unusual niche, to be sure, but one in which the Dedham resident has long felt comfortable. Trained in classical guitar and jazz vocals at Berklee College of Music, Feldman first began thinking about the connection between death and music when she lost her father 20 years ago. "His situation did not involve hospice care; he died suddenly," she said. "But something about the process of grieving for him made me think increasingly about the role music plays at our most troubling times." Ceremonial music has always attached itself to rituals and rites of passage - weddings, graduations, bar mitzvahs, holiday observances - with one notable exception: There is no particular music that most people associate with death. But Feldman, 49, has taken care to educate herself in the musical traditions of a variety of cultures, so that she can best match the music she plays to the heritage and preferences of the patient she is playing for. While some patients react well to a soothing background soundtrack of quiet guitar music, others request jazz, hymns, or folk songs. "Even when patients are too sick for verbal expression, the nurses can tell me when they are responding well to my music - their breathing may become less labored, for example," Feldman says. Judith Jackson of Concord agrees. "My mother was in her final week of life when Marcia came to play for her," Jackson said about her mother's death last October. "It was a wonderful gift not only to my mother but to me. I was spending hour after hour sitting at her bedside, and then Marcia would come in and play this very soothing music. The nurses told me the last thing to go is the hearing. And my mother always loved that type of music." Feldman's career in hospice music began nearly two decades ago at the Sherrill House in Jamaica Plain, a nursing and rehabilitation center. There, she played for patients in treatment and at memorial services. When Barbara Chenoweth, a nurse from the Sherrill House, took a new position at Carleton-Willard Village, a continuing care retirement community in Bedford, she invited Feldman to try out her skills playing at the bedside of dying hospice residents. To Feldman, who holds a full-time job as an administrator at Harvard Medical School unrelated to her work as a musician, it felt like a natural outlet for her creativity and spiritual attraction to music. "I don't call it music therapy, because I am not trained as a music therapist; I'm trained as a musician," she says. And yet patients and their families seem to find therapy indeed in what Feldman provides. "Her music and her outstanding vocals really promote a very special and unique shared experience between the patient and the family, and that in itself creates an everlasting memory," said Janet Macero, director of social services for Carleton-Willard. "Families go away from the experience with fond memories of those moments they spent together and of the very special music that they shared." "Being in a situation when a person is in the process of dying is very difficult," Jackson said. "Many people would do that only for their own loved one. I was so impressed that Marcia was willing to give of herself to such an extent." These days, Feldman's musical ministries are part of the package that Carleton-Willard provides in its groundbreaking approach to hospice care. Officially unveiled this month, the package's services include massage, Reiki therapy, help preparing an "ethical will" - a document clarifying the beliefs and core values of the dying person - and intense sensitivity to the needs of the survivors. Feldman is available to come to the patient's bedside as needed in their final days or hours. Having such a personal perspective on death - a firsthand view, as it were - has affected Feldman's understanding of life. "In the final hours, there is a kind of flickering," she said. "Especially as the breathing becomes unsteady, and sometimes there are very long pauses from one breath to the next, you get a strong sense that the patient is indeed between two worlds." CDBaby.com or at P.O. Box 4134, Dedham, MA 02027-4134.